President Ali Bongo has returned to Gabon after receiving treatment for a stroke he had in October. His reappearance came a week after a coup attempt was thwarted and days after he appointed a new government. Gabon's ailing President Ali Bongo arrived back in Gabon after spending three months receiving medical treatment abroad, according to sources quoted by news agencies Reuters and Agence France Presse (AFP). Culture Minister Alain-Claude Bilie-By-Nze confirmed to DW that the president had returned to the Gabonese capital, Libreville. 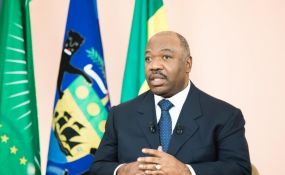 "President Ali Bongo is indeed in Libreville," said Bilie-By-Nze, adding that the president would personally lead the ceremony in which the cabinet would be sworn in. Bongo's return to Gabon comes a week after a small military group took over a state radio station in an attempted coup. The power grab was quickly thwarted, but exposed growing frustration in the oil-rich coastal African nation over his secretive absence. Bongo appointed a new government on Saturday, including naming Julien Nkoghe Bekale Gabon's prime minister, in an apparent effort to shore up his political base. Gabon's constitution states that ministers must take their vows before the president, and his return could make that obligation possible.